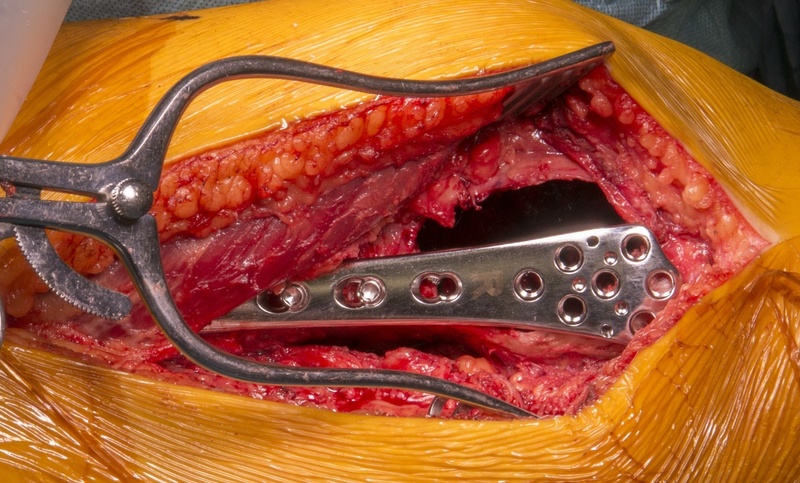 Learn the Distal Femoral Giant cell tumour of bone: intra-lesional curettage and stabilisation surgical technique with step by step instructions on OrthOracle. Our e-learning platform contains high resolution images and a certified CME of the Distal Femoral Giant cell tumour of bone: intra-lesional curettage and stabilisation surgical procedure. Giant cell tumour of bone is a rare, benign primary bone tumour arising in the meta-epiphyseal region of bones in young adults.This tumour classically arises in the meta-epiphyseal region as a radiolucent lesion most commonly affecting the distal femur, proximal tibia, proximal humerus and distal radius. Surgical treatment involves intralesional curettage with or without internal fixation or en-bloc resection and limb-salvage reconstruction. The decision on the type of surgical treatment to undertake in a patient with GCTB depends on a variety of factors including the Campanacci staging at diagnosis, articular involvement and anatomical location. Denosumab has recently played a role in the management of GCTB but the optimal use of denosomab has yet to be identified. Denosumab is a monoclonal antibody to RANK ligand recommended as the first option in inoperable or metastatic GCTB. Denosumab has also been used pre-operatively to downstage tumours with large soft tissue extension to allow for less morbid surgery.